Saint Spyridon was born in the late third century at Assia, a village in the central district of Famagusta. Spyridon married a pious woman, with whom he gave birth to children. Among these children was also Irene. His wife, however, reposed early, and therefore the Saint took the responsibility for the upbringing of their children all by himself. The life of Saint Spyridon was full of tests. The death of his daughter Irene was one of the most painful incidents in his life. His daughter died while the Saint was attending the Synod of Nicaea in 325. On his return to Cyprus he was visited by a woman who with great agitation told him that she had given his daughter a valuable treasure to keep, but in the meantime Irene had died, without returning it or revealing the location where it was hidden. The Saint went to the tomb of his daughter, followed by many others, and there he addressed his dead daughter as if she was alive, and asked her to tell him where she had put the woman's treasure. She in turn momentarily regained life, and announced to her father the place where the treasure was, and reposed again. So the Saint returned the treasure to the woman. Saint Irene the daughter of Saint Spyridon is not mentioned by any Synaxaria. However, she is included among the saints of the Church of Cyprus. 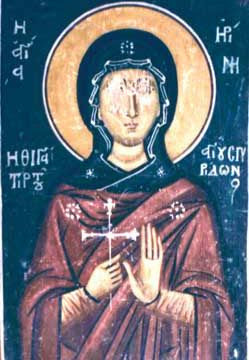 A fresco of Saint Irene is to be found at the narthex of the Church of Panagia Asinou which was painted sometime between 1332/1333.